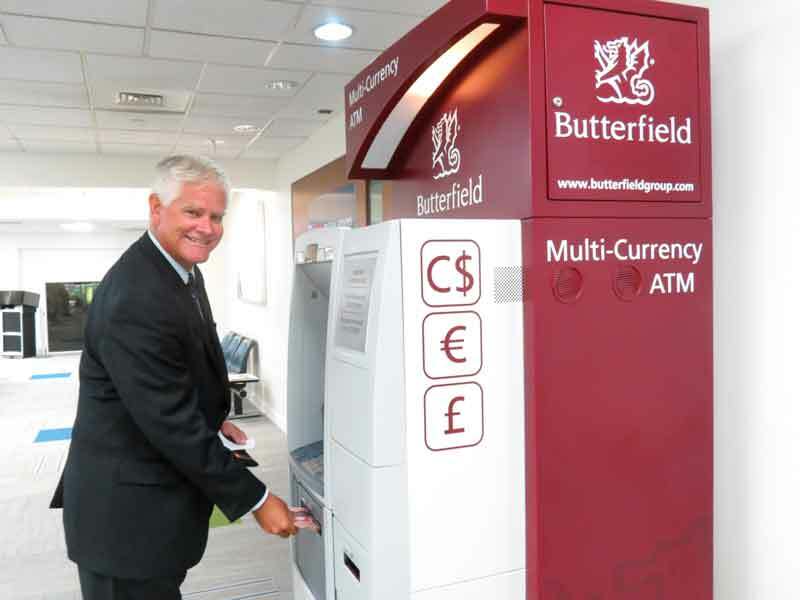 The Bank of Butterfield has unveiled the island’s first multi-currency ATM in the newly refurbished international departures lounge at L.F. Wade International Airport. The ATM, which is located airside [past security] outside the British Airways Lounge, dispenses Canadian dollars, Great Britain Pounds and Euros. Sean Lee, Executive Vice President and Head of Retail Banking withdrawing Canadian Dollars. The ATM, which will only accept Butterfield ATM cards, will allow customers to withdraw up to C$/€/£ 600 from their Butterfield accounts, denominated in C$/€/£ 50 notes. The same foreign exchange rates that are in place at Butterfield Banking Centres, along with the foreign currency purchase tax [FCPT] will be applied to foreign currency withdrawals at the airport. Obtaining foreign currency before leaving Bermuda is generally cost advantageous for customers versus withdrawing cash whilst abroad. Mr. Lee explained, “When you withdraw cash from an ATM overseas, you incur the overseas bank ATM and FX fees on top of local bank fees and FCPT, which makes it a costly transaction. Butterfield is currently working with Airport authorities to install a US dollar ATM in the US Departures Lounge to service its customers travelling to the US in the near future. Aaron Adderley, General Manager of L.F. Wade International Airport says, “We are glad to be working with Butterfield to help make travelling more convenient for our customers. This is in the International departures lounge, for non-US flights. Putting USD here would not make much sense. This does not accommodate travelers into Europe or Canada connecting through the US if located past security in the BA lounge! i.e. Someone traveling BDA via NYC to LON would not be allowed into the BA lounge! Actually a cool idea and I agree that this would be useful in the other departure lounge as well. I look forward to the banks also promoting the use of debit cards over cash and also maybe other forms of electronic payment like Apple pay when it goes live, as we all know cash leads to other problems… Of course not everyone is tech savvy or tech ready, and also electronics sometimes fail, but they are still more secure than having and using cash.